Our Summer Sheet is made of 1000 Denier Cordura accented with Polypropylene Webbing. 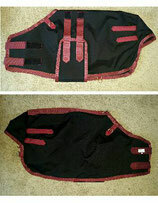 Special features include a tailored tail piece and belly band with velcro closure. Please specify color choice and open or closed front in comments.